(December 1, 2011, Columbus OH) Comic Creators For Freedom announced today that the prep work for their third annual fundraiser against Human Trafficking Awareness has begun. Each year comic creators (web and print) collaborate to create an image that is available in both digital and print formats. This year’s theme is the “Epic Snowball Fight”. Poster prints will be available from all three fundraising campaigns. As always, the image will be available digitally in exchange for donations. The donation drive starts on January 9th to coincide with National Human Trafficking Awareness Day which is January 11, 2012. The drive ends Friday January 20, 2012. The official website for the drive is www.comiccreatorsforfreedom.com. Artists who wish to participate must submit artwork by the end of the year and can contact organizer Lora Innes at comics4freedom@gmail.com.This years returning artists already include Danielle Corsetto (Girls with Slingshots), Crystal Yates (Earthsong), Scott Christian Sava (The Dreamland Chronicles), and Thom Zahler (Love and Capes). A special podcast for the event is available at http://tgtmedia.com/podcast/ep193-comiccreatorsforfreedom/. 100% of donations are being split between Love 146 (www.love146.org) and Grace Haven House (www.gracehavenhouse.org). Just a quick test post to show that I can blog from my new tablet. Once I get used to the keyboard, I may use this for blogging all the time. OneBookShelf, Inc., the parent company of DriveThruRPG.com and DriveThruComics.com, announced today that they recently launched DriveThruFiction.com. DriveThruFiction.com is a genre-focused website that will offer e-books, audio, visual, and print editions of short stories, novellas, novels, and more. Readers can subscribe to their favorite authors and publishers in science fiction, horror, fantasy, and several popular sub-genres including steampunk and paranormal romance. Independent and traditional publishers can take advantage of on-site marketing tools when they sign up for an account. These tools are unique to the DriveThru family of sites and are offered at no charge. Currently, the website has dozens of new and established publishers already signed up including Apex Publications, Bards & Sages, Blackstone Audio, FW Media, Morrigan Books, Northern Frights Publishing, and White Wolf Publishing. There are also a number of authors publishing their own titles on DriveThruFiction such as Greg Stolze, Joseph Nassise, Paul S. Kemp, and R.A. Salvatore. The publisher relations manager for DriveThruFiction.com is Matt M McElroy. About DriveThruFiction: DriveThruFiction.com is part of the OneBookShelf family of sites that includes DriveThruRPG, DriveThruComics, RPGNow and WarGameVault. OneBookShelf has been operating e-book marketplaces for over ten years, sending millions in royalties each year to thousands of publishers and authors. This, my readers, is opinion writing. In this current economy, in this current market for the tabletop gaming industry, it is sometimes a fight for each and every sale that a publisher makes. More and more, there is a reliance on the early adopter, or the so-called "alpha gamer," to help create buzz and talk up your games online, in gaming groups, and other places to lead to sales. The right words from enough of the right people can lead to good sales for an RPG publisher. Early adopters can be very important, they are what drive things like Kickstarter projects to be so successful. The problem comes when you kick the early adopters to the curb. Yeah, I know this is strong language and that is intentional. I'm not going to crouch this post in vague language about "some publisher" out there. This is in response to the specific action of a specific publisher: Arc Dream Publishing. Part of the reason for my making this post is because this isn't the first time this has happened. I know, there are many out there in gaming fandom who do not think we should talk poorly of publishers. "It's just a one man operation." "He's not in it for money, it's for the hobby." The same things we hear each time a publisher slips at something. Yes, we all do it, but for those trying to be a business, they should be treated like a business. Arc Dream Publishing is a business. At GenCon Arc Dream was selling the new Fate edition of their Kerberos Club setting. It's a great book, and Mike Olson did a bang up job of creating his Strange Fate variant for the setting. I love the game, have spoken highly of it both online and off, and I have recommended it to a good number of gamers. GenCon was in August. Thanks now to POD (Print On Demand for those who do not know) technology, Arc Dream is offering a revised edition of the Fate edition of Kerberos Club. Errors were found by those early adopters, and those who bought copies of the game because of the praises of those early adopters (myself among them, obviously). Yes, this means that a up-to-date ruleset is available for those currently purchasing the game...mostly due to the praise of the early adopters. Let me say that again: a new revised edition in just a couple of months. Yes, the technology makes doing this possible but does that mean that a publisher should do it? Could a simple booklet of errata have been done and distributed to old and new purchasers? People get upset when a new edition of a game comes out in a few years after the game they purchased, but now we have that cycle shortened by technology to a few months. I know that some people will say that this is not a new edition. I say that if you are going to say something is revised, it is a new edition. Part of the problem is that this is not the first time this has happened. A few years ago, also at GenCon, Arc Dream also released a new book...the Wild Talents Essential Edition (which I also purchased from them at the time it was first released). Quickly, it became apparent that there were a number of mistakes and errata threads started appearing on the Wild Talents mailing list, and places like RPGNet. Arc Dream compiled all the errata, along with some of their own, fixed the stuff in the new book and offered up a revised printing. What did they do differently back then? They made an offer that any one who bought the first printing could mail it back to them and get a copy of the fixed new printing. What are they doing this time? Offering the new version at an additional charge. Yeah, it's only ten dollars. I realize that. It's the point of rushing something to press, to get the book out at GenCon (not once but twice) only to have it need to be corrected. Why? Because of that important buzz from early adopters and bloggers out of GenCon. How many times, however, are people going to be willing to be the early adopters when they realize that the books they are buying are just going to be replaced in a few months? How much good buzz is it when someone has to write a blog post like this about a publisher? Yes, I am one man and one blog. I don't speak for the masses of geeks, dorks, or gamers out there in the world. I only speak for myself, and I think that this stinks. Each dragon is a deadly match for an experienced band of adventurers. Of all the monsters in the world, dragons are the most feared. A fledgling group of adventurers might have what it takes to best a weak dragon, but the most powerful dragons are awesome, devastating creatures that rival even the gods. 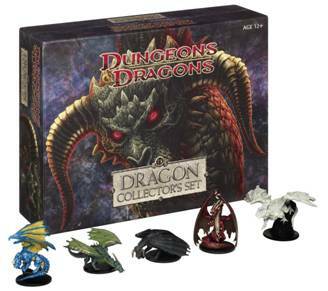 This set includes the five most iconic evil dragons in the Dungeons & Dragons game, with origins tracing back to the game’s earliest editions. Two of the dragons are new sculpts that have never appeared in any previous D&D miniatures product. The pre-painted plastic dragons in this set appeal to both D&D players as well as dragon aficionados. Each box contains five non-random, pre-painted, durable plastic miniatures for use in the Dungeons & Dragons Roleplaying Game, and has a suggested retail price of $44.99. National Game Design Month: What Is Urban Fantasy? I will admit up front that I do prefer urban fantasy written by women, although I don't have to have female protagonists in them. I think this is the only genre where I have a gender-bias for writers, but I have it. I think the Night Watch books by Sergei Lukyanenko are the only exception to this preference, although Simon R. Green's Nightside books aren't too bad either. I will say that I'm not a fan of the Dresden books as much, something about the genre mashup just hasn't sat as well with me. Basically the reason for this essay/post is to outline what urban fantasy is to me and show the influences that will work their way into my NaGaDeMon work.